Stainless steel fixed height frame is 64” wide (load side) x 52” deep x 90” high. All welds are continuous TIG with no pits or pockets, product contact welds are polished smooth. Unit features a stainless steel fill head with an 8” diameter removable fill tube. Food grade inflatable spout seal assures a dust-tight seal to bag inlet spout. Stainless steel bag hanger system can be quickly adjusted to fit a wide range of bulk bag footprints. Fully integrated carbon steel gain-in-weight platform scale system with a stainless steel deck cover for protection during loading and unloading of pallets. Scale system features a portability frame for easy transportation. 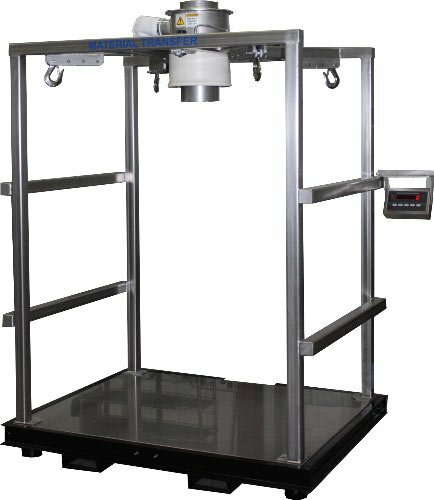 Scale system utilizes stainless steel load cells. 115 volt digital weight indicator with NEMA 4X enclosure. Weight indicator includes an adjustable swivel mount.